Some developers will do anything to get out of programming a convincing day-night cycle. Warner Bros Montreal have set the entire events of Batman Arkham Origins on one uniformly dark Christmas Eve, during the course of which Bruce Wayne will truly learn what it means to be a wanted man and completely forget to pick up the turkey from M&S. 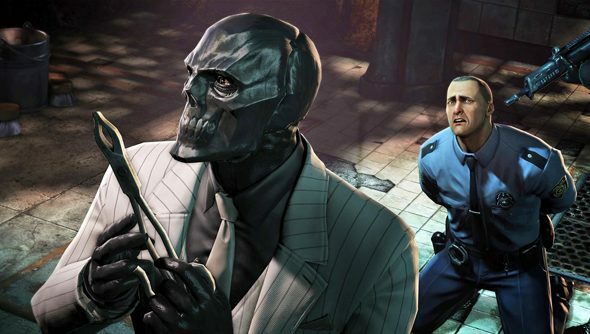 The man responsible for both ominious events is called Black Mask, which must be an American name. Never heard of anyone called that before. He’s all over this trailer, incidentally. We pick up Bruce at an odd point in his life in Origins. Gordon hates him, villains know him only as an up-and-coming vigilante, and Alfred looks far too young. Should make for an interesting setting, no? Besides, you need the practice. You probably weren’t as good at Batman: Arkham Cityas you thought you were. Warner Bros say so.